Rated: R for strong crude sexual content and language throughout. A New Line Cinema Presentation, a Benderspink/RatPac Entertainment Production. It will be distributed by Warner Bros. Pictures, a Warner Bros. Entertainment Company. 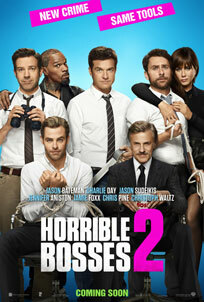 Jason Bateman, Charlie Day, Jason Sudeikis, Jennifer Aniston, Jamie Foxx, Kevin Spacey, Chris Pine and Christoph Waltz star in HORRIBLE BOSSES 2, a film directed by Sean Anders. Image courtesy Warner Bros. Pictures. All rights reserved.